Documentary Scours Our Noisy Globe 'In Search Of Silence' Director Patrick Shen features plenty of talking heads opining about our essential need for quiet and solitude, but this film works best when he captures moments of pristine, meditative stillness. Tea ceremony participants in Kyoto, Japan from In Pursuit of Silence. The premiere of John Cage's famous/notorious composition "4'33"" in Woodstock, New York in 1952 stirred some measure of the outrage that greeted Stravinsky's "The Rite of Spring," only here the audience was upset by the notes they didn't hear, instead of the ones they did. The first of three movements started with the pianist opening the keyboard lid and ended with him closing it; that same pattern was repeated for the next two. After four minutes and 33 seconds, the composition was over and the fury began: "Good people of Woodstock," one audience member declared, "I think we should run these people out of town." The good people of Woodstock felt cheated because they came to a music concert and heard no music. Cage's piece implies that the deliberate, conscious silence heightens awareness of the fact that music is everywhere—in the natural sounds bleeding through from the outside, in the shifting of seats, in the whispers of "isn't this pretentious twaddle?" wafting down from the balcony. In the decades since, Cage has won the argument: "4'33"" remains his most widely discussed and celebrated work, and it's been performed by underworked orchestras in venues as exalted as Carnegie Hall. It seems the noisier the world gets, the more essential Cage's work as an aural palate-cleanser. Patrick Shen's documentary In Pursuit of Silence include Cage's work in a spectrum of other sounds, from the quiet of a Kyoto tea ceremony to the decibel-bursting street noise of Mumbai during its three-month festival season. Its central purpose is the same as Cage's: To make the viewer aware of the sounds they accept without thinking and the ones they're not attuned to hearing at all. Shen makes his case through a globetrotting survey of different soundscapes and interviews with doctors, theologians, scientists, and others who proselytize about the virtues of quiet and solitude. As much a visual treat as an aural one, the film divides its time between using the tools of cinema to isolate and enhance the beauty of sounds and silence and exploring different schools of thought on the subject. Shen follows Greg Hindy, a young hiker who decided to trek from Nashua, New Hampshire to Los Angeles, California without speaking a word, looking to confirm his intuition that his vow of silence would open him up to other inputs. 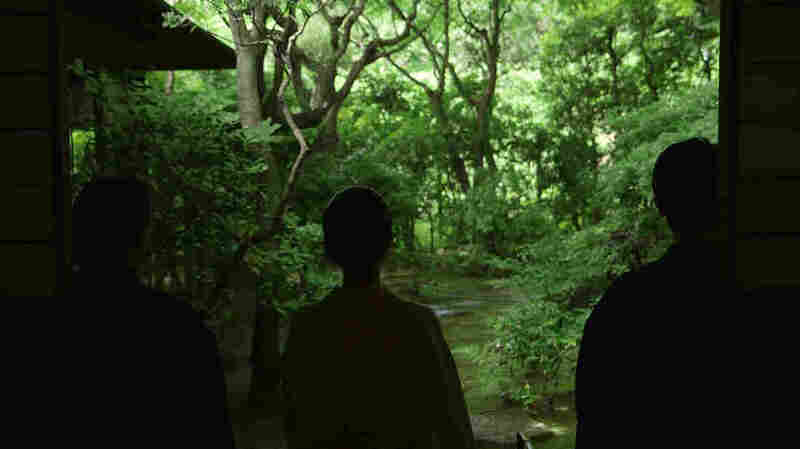 He visits Okutama Forest in Japan, where an environmental research has established therapeutic retreats under the conviction that quiet can help relieve stress and prevent disease. He interviews a student and teacher at a New York public school where noise from the passing train disrupts 15% of instruction, debilitating the learning process. In Pursuit of Silence aims for a comprehensive study of its subject, from the impact of sound pollution to the cacophony of urban centers and technology to the scientific and religious belief that silence brings us closer to our natural, primal, selves. To some extent, the film is fundamentally at odds with itself: There's no easy way to reconcile the push-and-pull between conventional documentary interviews where experts share their thoughts and the wordless rapture of sequences where Shen illustrates the point through sound and image. Shen wants to be informative and demonstrative, and he struggles to have it both ways. Not surprisingly, the film works best as pure cinema. It's one thing to talk about noise and solitude, but much more powerful for Shen to cut from the "soul-crushing din" of cable-news arguments to the tea ceremony in Kyoto, where no voices compete against each other for attention. In another sequence, Shen isolates various sounds — rain on a rooftop, a child crying, radio static, a marching band, the ambience of Sixth Avenue — into a kind of sensory test, calling on us to assess their specific value. Fitting for a documentary about the value of quiet, In Pursuit of Silence is better when it shows than tells.